We act as credit brokers and we are not a lender. †Includes £750 Deposit Allowance Paid By Manufacturer. *Excess mileage charge of 7.5p per mile. If you exceed this annual mileage then excess mileage charges will be applied by the finance provider at the end of the agreement should you choose to return the vehicle. Finance subject to status. A guarantee may be required. Terms and conditions apply. Unless otherwise stated, metallic paint at extra cost. Library image for illustration purposes only. 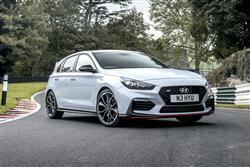 Hyundai's i30 N is Korea's very first really credible performance hot hatch. Every car in this segment claims to be engineered to get your heart pumping and your pulse racing but this one really can. Track-tamed and road ready, it'll surprise you enormously. And the version you'll want is this upgraded 'Performance' model. Just about everything that could be changed in creating this high performance derivative absolutely has been. Aluminium has been added to the electronically controlled suspension to reduce weight and increase stiffness, plus there's a bespoke-fit set of adaptive dampers. The single gearbox option, a 6-speed manual stick-shift, has been specially developed for this car and its clutch is uprated. There's also a selectable rev-matching system to make you sound like Fernando Alonso when you're downshifting through the gears. In addition, the brakes are beefier, camber stiffness is up and the Pirelli P Zero tyres are of a unique compound. Yes, the 2.0-litre GDI engine is derived from a unit that Hyundai's had on its books for some time, but it's been embellished with a new turbo and a new intake manifold. There are two variants on offer, a standard model offering 250PS and this top 275PS 'Performance' version which gets two extra key engineering features. One is an emotive-sounding Active variable exhaust; the other is a proper mechanical electronic limited slip differential for extra cornering traction. Both are features you'll want, plus this 'Performance' derivative is of course also slightly quicker off the mark than its standard stablemate. Make full use of the standard Launch Control feature and you'll reach 62mph in just 6.1s en route to an artificially limited top speed of 155mph. Various driving settings are available to you as an i30 N driver. The one you'll want to try is the most ballistic 'N-mode', which dials steering, throttle and suspension settings right up to the max. 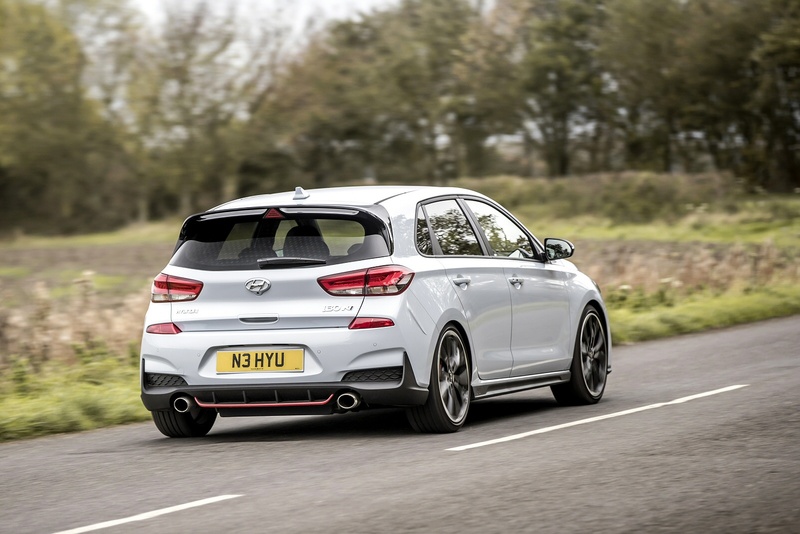 There's also a configurable 'N-Custom' programme that allows you to choose different settings for different dynamic elements and set this Hyundai up just as a professional driver would set up his race car. Brilliant. It must be difficult to know how to visually pitch a hot hatch of this kind if you're a company starting out in this segment. At the front, extra cooling vents are incorporated right across the lower part of the nose section so as to channel air towards the GDI Turbo engine and the uprated brakes. Enough with that: let's take a seat at the wheel. 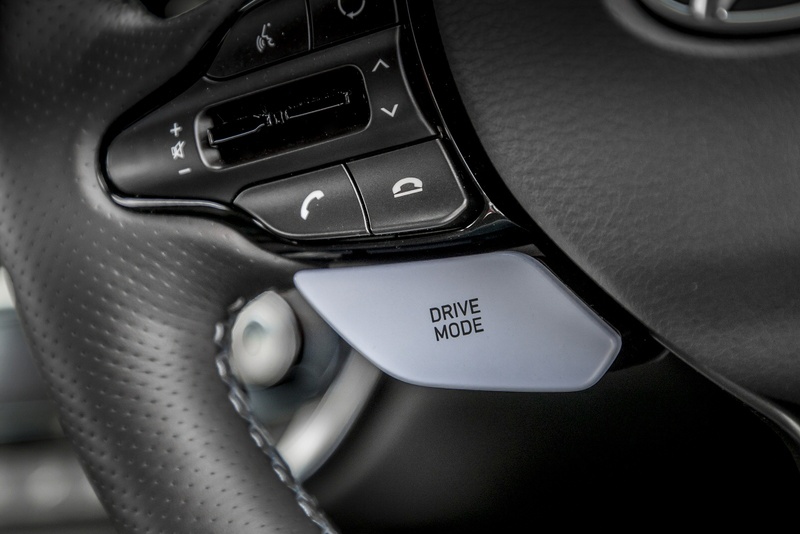 Should you go looking for it, there's subtle 'N'-branding on the floor mats, the door sill scuff plates, the steering wheel and on this lovely tactile round gear knob; plus there are these unusual light blue 'Drive Mode' and 'N mode' buttons on the steering wheel. But that's about it in terms of the cabin changes made to create this shopping rocket model. Time to move to the back seat. And once inside? Well what can we tell you? 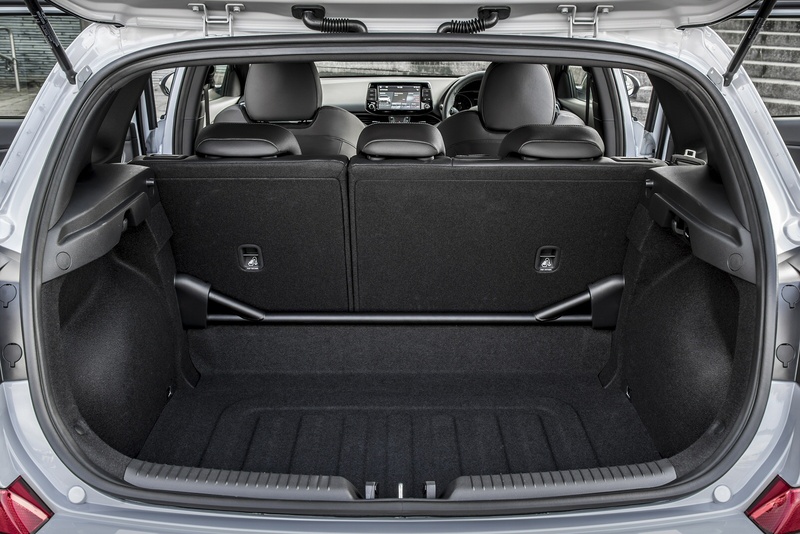 It's not the roomiest rear cabin in the class - you'll need a Skoda Octavia vRS for that - but by the standards of most other family hatch-sized GTi segment contenders, the space provided in the rear is quite competitive and probably as much as most buyers will need. 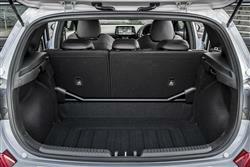 As for boot space, well the 381-litre cargo capacity is class-competitive. There are two i30 N variants on offer, both with five doors and both using basically the same 2.0-litre turbocharged engine driving through the front wheels and mated to a 6-speed manual gearbox. As is common at this price point, there's no paddleshift auto option, nor is there the chance to specify 4WD. 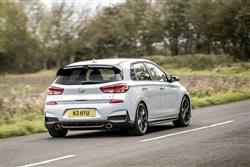 The standard model puts out 250PS, costs around £25,000 and is targeted at conventional family hatch shopping rockets like Volkswagen's Golf GTI and Ford's Focus ST. Hyundai though, expects over 90% of i30 N buyers to find the extra £3,000 to get themselves into the alternative £28,000 'N Performance' variant that we tried. With this more desirable derivative, you get a version of that same GDI engine tuned to develop 275PS, plus an important package of extra engineering features including an electronic limited slip differential and an active variable exhaust system, plus some tempting trimming embellishments. 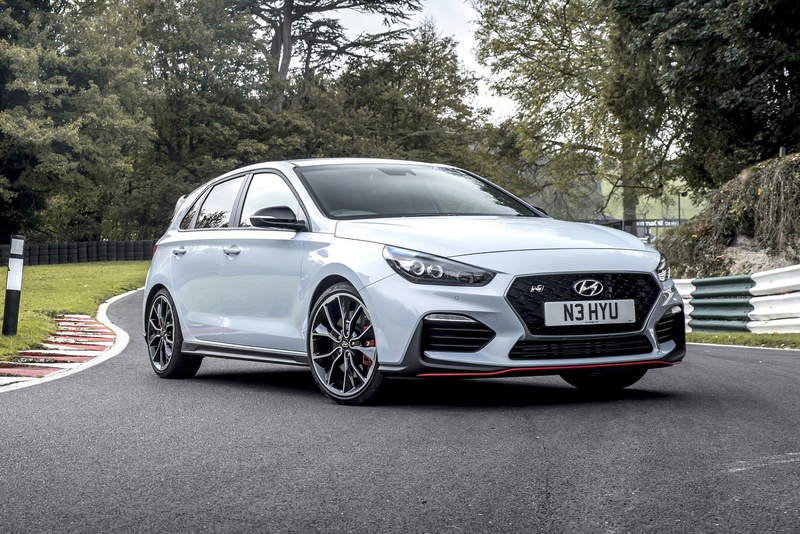 In this upgraded form, this Hyundai can tilt at more powerful volume class contenders like the SEAT Leon Cupra 300 and the Renaultsport Megane. 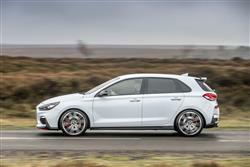 And - potentially - even start to trouble so-called 'Super Hatches' with just over 300PS, cars like Honda's Civic Type R and Volkswagen's Golf R. Standard camera-driven safety features include 'AEB' 'Autonomous Emergency Braking', 'DAA' 'Driver Attention Alert', an 'LKAS' 'Lane Keeping Assist System', an 'SLIF' ' Speed Limit Information Function' and 'HBA' 'High Beam Assist'. Before perusing this i30 N model's fuel and CO2 stats, we'd expected it to lag behind rivals a little in that regard. After all, the 2.0-litre GDI petrol unit this model's turbo powerplant is based around doesn't have a reputation for being particularly frugal, plus there's the fact that with a kerb weight of around 1.5-tonnes, this car is one of the heavier hot hatches in this segment. As it is though, this Hyundai gets pretty close to the required class standard. The ordinary version manages 40.4mpg on the combined cycle and 159g/km of CO2, figures that fall only slightly to 39.8mpg and 163g/km if you go for this upgraded 'Performance' model. That translates into a Benefit-in-Kind tax liability of either 30 or 31%. Of course, as usual with a hot hatch, if you get anywhere near the quoted figures in real world use, then you probably shouldn't have bothered buying the car in the first place. Still, if you are in a frugal state of mind, it's useful to be able to slot into the 'Eco' driving mode and focus all of the car's systems on efficiency. As you'd expect, the i30 N features the brand's 'ISG' Intelligent Stop and Go technology that cuts the engine when you don't need it, stuck in traffic or waiting at the lights. Insurance is group 28E. If you�re looking for a new Hyundai i30 2.0T GDI N 5dr Petrol Hatchback for sale, you�ve come to the right place. 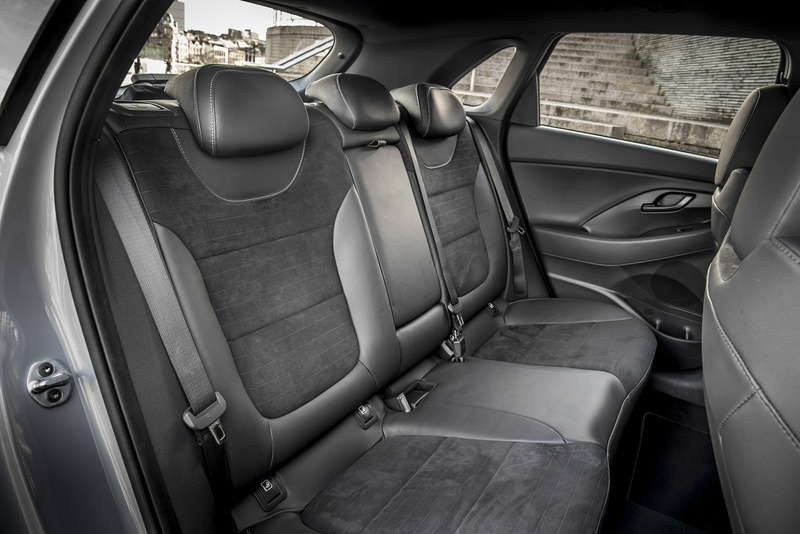 At Bristol Street Motors we don�t just have the best Hyundai i30 2.0T GDI N 5dr Petrol Hatchback deals, we also offer friendly advice and help with all your enquiries to ensure your buying experience is a happy experience.